Each year, Shoppers partners with different organizations to help make a difference in our community and beyond. Here is a sample of the great programs and services Shoppers supports. Education is important to Shoppers. Each fall we support a school supplies drive to get children the supplies they need to succeed. Customers may purchase a pre-filled bag of school supplies, which is donated to local kids in need. Leukemia remains the number one disease killer of children and young adults under the age of 19. 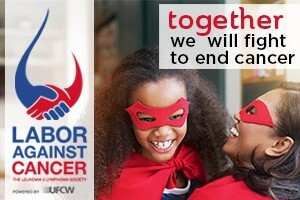 We partner with the local UFCW and The Leukemia & Lymphoma Society in the fight to end cancer. Our generous customers donate at register to contribute to the Labor Against Cancer. Many individuals in our community are food insecure, and the need for food assistance is rising among children, seniors, and working families. 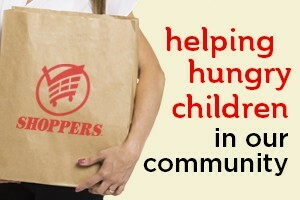 Every year, Shoppers fights hunger through a food drive. Customers may purchase a $5 pre-assembled bag of nonperishable food items at Shoppers, which is donated directly to local food banks. We also run a month-long public service campaign for Hunger Month that heightens awareness about hunger in the communities we serve.